I’ve mentioned before that one of the main attractions I have for Gail Simone’s The Movement is that it is well-off the oft-trodden path that superhero comics generally take. They are loud and grand and often quite fantastical. In an almost complete about-face, Gail’s new series for DC is something much more personal, much more relevant. This is a series that deals with vigilantism and corruption with a superhero flavour. It posits a situation where the people rise up en masse to protest against those in power, those are abusing and corrupting the system for their own gains, and showing them where the true power is. The first issue of the series was a great opener. The second and third issues set a high bar. And now, the fourth issue has raised the stakes once again. The Movement is a series that seems to be getting better with each issue. In this issue, we see a lot of the fallout from the previous issues finally begin to play out. We also see a ton of character building here, something that I was very much looking forward to, as per my review of the previous two issues. We get to see the origins of Mouse (Jayden), Katharsis, Tremor (Roshanna Chatterji), and Burden. Of course, we also get to see the Coral City Police Department get taken for a ride as an angry The Movement mob rushes the police headquarters, led by Virtue and her team. Much as with the first issue, there isn’t all that much action in the book, not when compared to issues 2 and 3 at any rate. And I was perfectly fine with that. The series is beginning to get a good feel for itself and the timing was just right to delve into the characters more than the action. Pretty much every character we’ve seen so far, whether belonging to Virtue and her team, or the bad guys and the CCPD, gets some kind of look-in here. The interludes with the four heroes above do a great job of bringing down the breakneck pacing of the script and give some of the best moments in the story. Of particular note, we finally get to see why exactly Tremor joined The Movement and this ties her back into the main DC universe, which was a really cool moment. Unexpected and well-written, it also highlighted the manipulative and predatory nature of one of DC’s “good guy/bad guy” characters, who has been appearing throughout various DC books in the last few months and has become a sort of a high-profile side character. Burden’s interlude made for the most tragic story, in comparison, and it is something that was quite touching. But, given his particular affliction, perhaps not all that surprising. Unfortunately, we don’t see much of James Cannon this time around, but that’s fine with me, since this book was clearly focused on The Movement itself and fleshing out its higher-profile members, rather than the bad guys. Given how the issue ends however, I fully expect him to start getting a major role, and that’s something I’m more than looking forwards to. As an aside, I can’t give enough praise to Gail for including Tremor in this series. She is an Indian girl and given how she debuted in the series, and the interludes in this issue, Gail has been treating her really well and she is definitely my favourite of the bunch alongside Mouse and Virtue. I’m an advocate of racial, gender and national diversity in comics (and whatever other kinds of diversity you can think of! ), and for me, The Movement #4 deserves top marks. Scott Lobdell too introduced an Indian female superhero in his Teen Titans books, Kiran, but she has been woefully underused thus far. I’ve read 20 issues in all of the series and we have yet to see anything resembling even a sliver of her back story. And yet, Gail does it fantastically with Roshanna in two quick pages that also serve to establish her as a character with agency and someone willing to do the right thing for the right reasons. I’ve talked before about how good Freddie Williams II’s art is on this series and the new issue is no different. There are a few cases where the characters are too indistinct and some of the facial expressions aren’t too clear or just weird, but overall, he has been doing an excellent job. The new issue isn’t as bloody as the previous one was, but still, Freddie has maintained the rough-and-tough-and-grim look of the series. I would love to see him work on some higher profile series and I think he’d make a great artist for any of DC’s edgier books like Batman, Batgirl, Superboy, etc. And Chris Sotomayor has been great as well. His colours with Williams’ art is a really, really good mix. 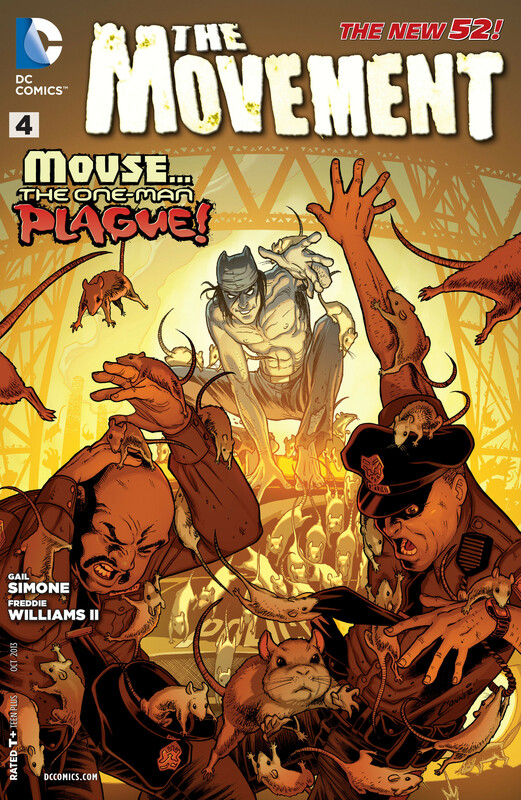 Finally, I commend Amanda Conner’s spectacular cover for the issue, which shows of Mouse with all of his mouse-y glory and creepiness. And Dave McCaig’s colours are just perfect there. The yellow is a good effect there, with the subtle reference to a rat plague. Don’t think too much about it, just go and get the issue. And if you are a new reader, then definitely go pick up the previous issues! More The Movement: #1, #2-3. Posted on August 8, 2013, in 2013 Writing Challenge, Challenges, Comics Reviews, Review Central and tagged 2013 Reading Challenge, Challenges, Chris Sotomayor, Comics, Comics Reviews, Freddie Williams II, Gail Simone, New 52, Review, Review Central, Superheroes, The Movement, Vigilantism. Bookmark the permalink. 11 Comments. Great review, I agree 100%! Didn’t expect to like The Movement as much as I do, and I’m glad that Simone created a new DCU city, Coral City, for this to play out in. I also liked the fact that the Movement seems to be spilling over into Metropolis, Gotham, and San Francisco! I would love to see the politics of the Movement begin to affect the characters in the rest of the DC universe. Wouldn’t that be fun? It sure would be! Frankly, I would love for events in The Movement to at least be referenced in other titles. That’d be really cool.